Growing up one of my favorite meals was milanesa chicken. It’s like the Mexican version of country-style chicken. And it is good. Originally from Italy, this dish made its way into South America and has evolved from country to country. It’s also very similar to the Austrian wiener schnitzel. In Mexico, it’s commonly served on a torta, a kind of Mexican sandwich. I was so lucky to have this dish be such a staple in my home and feel a certain nostalgia when I think of it. Maybe it’s because of the fact that panko bread crumbs is such an important ingredient in this entree. That’s key to this recipe. For all my gluten free people, You can ditch the panko. I’ve created a gluten-free version just for you! 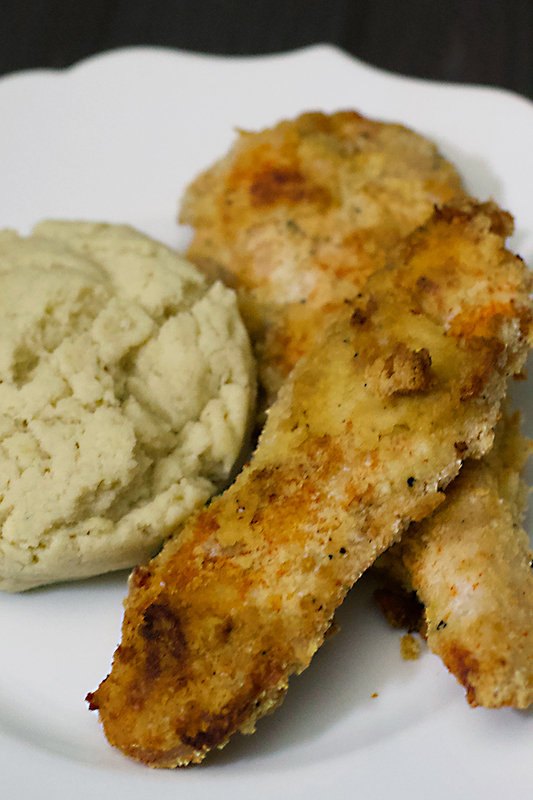 The flavor in this chicken is easy to bring together with the gluten-free breading. Speaking of which, gluten-free breading can be a bit tricky and I can’t lie and say that it didn’t take a few tries to perfect this recipe. 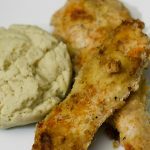 There were some mishaps that happened along the way, so be patient when working with gluten-free breading. Once you get all the flavors packed onto this chicken, you should be ready to cook it. You got options. Baking the chicken pieces creates a juicy final product, but may have minimal browning on the outside, while pan-frying will get all the browning on the outside but can get tricky if you leave it on too long or have the flame too high. Whichever way you prefer to cook chicken, you’re in for a world of deliciousness, bursting with flavor. Toast the three pieces of bread until very crunchy – but not burned. If they burn a little, that’s okay. Cut chicken breasts into thin slices. Each breast should be cut up into three thin pieces, longways. It’s okay if you don’t cut them all perfectly and evenly. The point is to cook them evenly. Measure out your wet ingredients into a bowl. Measure out your chicken spices into a third smaller bowl. Keep a 1/4 tsp measuring spoon in the bowl. Use a blender or food processor to grind chips with the other dry ingredients. This will be helpful in evenly distributing the crumbs over all of the chicken. Measure out your dry ingredient spices (under dry mix group) into the toast/chip bowl. Keep a spoon in the bowl. You can either cook the chicken on the stovetop or in the oven. IF COOKING ON FRYING PAN: Heat up frying pan with about 1/4 to 1/2 an inch of avocado oil on medium to high heat. While your pan is heating up, dip chicken breasts in wet mix and set on a plate. Lightly sprinkle about 1/4 tsp worth of the “Chicken Spices” to each side of each piece of chicken. Keeping the chicken on the plate, scoop a spoonful of the dry mix and use it to sprinkle mix over each side of each piece of chicken. You’ll want to completely cover each one as much as possible. After about 3 minutes, your pan should be hot enough. Lower heat to medium or a little less than medium. You will want to wait about 30 seconds before you add the chicken. The point of this is to ensure the pan is hot enough, but we don’t want to burn the outer part of the chicken and undercook them in the middle. Again, trying to cook evenly. Depending on how big the pieces of chicken are, you’ll want to add about 3-4 (or more if your pieces are smaller) to the heated pan. Cook them for about 3-4 minutes on each side. Feel free to check them with a thermometer. I usually just cut through them a little in the thickest part of the meat to ensure it’s no longer pink. Set each piece on a plate covered with paper towels to remove excess oil. IF COOKING IN THE OVEN: Preheat oven to 400. Once you’ve dressed the chicken with the wet and dry mixes, place them on a parchment lined cookie sheet for 15-20 minutes on each side. Make sure you check them after 15 minutes on each side. Enjoy! This recipe tastes even more delicious with Country-style Gravy and Buttery, Gluten-Free Biscuits.